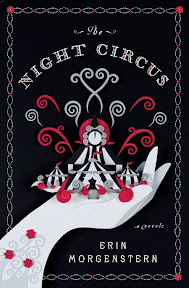 The Night Circus [Book Review + Giveaway] – my books. my life. Le Cirque des Rêves appears without any notice. Black and white tents with unbelievable wonders within. Night after night the patrons return until the circus departs as suddenly as it appeared. Celia and Marco are bound to a competition neither of them understand. Le Cirque des Rêves is their venue, but too many people have unwittingly become part of it. Bailey watched the circus from afar as a young boy. When it returns, he meets a young girl who gives him a white glove. Years later, he searches this girl as his future stands before him. The Night Circus has been called “the next Harry Potter” by too many sources to name. This is entirely misleading. It is neither young adult nor a series, and the only thing the two tales have in common is an element of magic. But it is so, so different. The Night Circus is worthy of praise in its own right, praise does not involve such comparisons. The Night Circus is enchanting. Celia and Marco’s long story is woven in between Bailey’s, which takes place some 16 years after Le Cirque des Rêves opens. The stories slowly unfold, but there is a sense of desperation as the two storylines begin to converge. This is not a mere tale of magic. It is a story of love, friendship consequences, and destiny. And the writing is delightful and just as enchanting as the story. Doubleday has been generous enough to provide an advanced reader’s edition to one lucky person. To enter, fill out the form below. I’m caught up in the fever this book is causing! Thanks for the giveaway, I don’t know how much longer I can resist the urge to break my book buying ban! I’m hoping to read this one soon. I have a copy coming my way, and I will be reading it as soon as it arrives. I hate when people compare books, I’m always skeptical of the comparison. Nice review, Michelle! I haven’t heard of this book or this author before, but from your review it looks quite fascinating! Two stories converging in the end looks quite interesting. This sounds so amazing. Your review really makes me want to read this. For some reason I thought it sounded a lot like a movie I saw a while ago which was good but I guess it made me think this wasn’t original. But sounds like I was wrong!! Must read this book! I even have a copy waiting for me. If I don’t get to it soon, I think I’ll be the last person on the planet who hasn’t read it! I’m anxiously awaiting the arrival of this one from my library. Cannot wait. Pingback: The Sunday Salon [9.25.11] | my books. my life. Pingback: Book Review: #109 (from 2011) – The Night Circus by Erin Morgenstern | Let's eat Grandpa!